Debbie attended her first yoga class in 2001. From the very first class she was hooked. It didn't take long for her to realize yoga was so much more than what happens on the mat. Wanting to deepen her personal practice and expand her knowledge of yogic philosophies she attended 7-Centers Yoga Arts located in Sedona, AZ in 2010. There she received her 200-hour RYT certification. 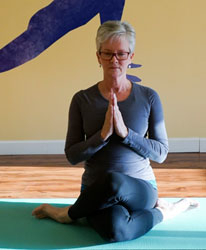 Debbie's teaching style focuses on balancing the body, mind and spirit through slower paced asanas, restorative Yin postures, pranayama, and meditation.